Despite the name, Captain America: Civil War feels more like an Avengers movie than a Captain America one (not withstanding Cap’s participation in both series). Those who attend this movie expecting to see a superhero smack-down won’t be disappointed, but anyone partial to Captain America’s saga may feel shortchanged. Although Civil War doesn’t ignore the events of Avengers 2: Age of Ultron (something I’m sure many fans wish was the case), it glosses over them. Instead, this is posited as a direct follow-up to Captain America: Winter Soldier. To the extent that Civil War can be said to focus on any one of a myriad of subplots (there are too many), it revolves around the fractious relationship between Captain America (Chris Evans) and his childhood friend-turned-Manchurian Candidate Bucky Barnes (Sebastian Stan). Once again captured by bad guys and reprogrammed to kill, The Winter Soldier returns to the nemesis column - at least for part of the movie. Aside from the Cap/Bucky relationship, Civil War is about adding a real-world element to the existence of The Avengers. Viewed with increasing distrust by nations around the world, the superhero group is asked to accept oversight by an international commission. Several of The Avengers - Iron Man (Robert Downey Jr.), Black Widow (Scarlett Johansson), War Machine (Don Cheadle), and Vision (Paul Bettany) - reluctantly agree. Others - Cap, Falcon (Anthony Mackey), Hawkeye (Jeremy Renner), Ant-Man (Paul Rudd) and Scarlet Witch (Elizabeth Olsen) - believe that autonomy is critical. Newcomers Black Panther (Chadwick Boseman) and Spider-Man (Tom Holland) side with Iron Man. Thus are the battle lines drawn and what starts as a political argument evolves into an all-out war. Consequences, however, are disappointingly limited. The recent Batman v. Superman attempted (with limited success) to address the subject of collateral damage from superhero actions - that the number of civilian casualties is unacceptable even when the objective (usually eliminating a supervillain threat) is achieved. 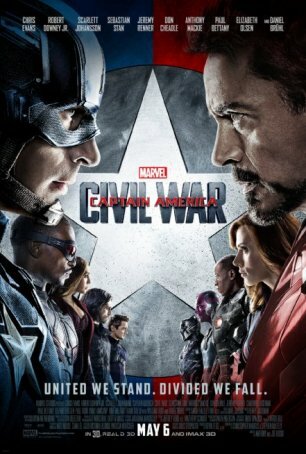 Civil War goes down the same road, with William Hurt and Martin Freeman providing the “voices of reason.” The concept of a government body regulating superhero actions is intriguing but it’s neither well considered nor effectively implemented in Civil War. In general, the X-Men stories have done a better job of this. But at least this movie addresses the subject matter rather than continuing to ignore it. The film’s success rests with its ability to match fans’ expectations when it comes to the superhero-on-superhero violence. Back in the 1970s and 1980s, cross-over comic book battles were always big sellers, and this is just the next step in their evolution. As in the comic books, nothing really bad happens when the good guys rumble despite the serious issues in play. So Civil War features a lot of pummeling and punching and blowing things up (which is quite fun in its own right) but that’s about it. Plus, with so much happening during the big battle, co-directors Anthony and Joe Russo are unable to keep up with the action. Some characters are left in limbo until the camera gets back around to them. This is a problem when so many characters are involved and the filmmakers don’t want to shortchange any of them. Late in the proceedings, an intimate fracas is more powerful, provocative, and compelling. That sequence works in a way that the battle royale fan service doesn’t. The stakes, which have personal as well as larger implications, are high. There’s drama in that fight; it isn’t only about spectacle. Marvel’s desire to integrate the Spider-Man character as quickly as possible into the so-called “Marvel Cinematic Universe” results in some poor storytelling choices. Although Spider-Man provides a valuable contribution to the battle, his painfully bad introduction hurts the movie as a whole. Given an opportunity, Tom Holland might grow into a credible Peter Parker but this isn’t an auspicious beginning. Thrust into the deep end as he is here, it’s hard to get much of a feel for the character or his circumstances. And, as much as I admire Marisa Tomei, it’s hard to think of a more bizarre casting choice for the role of Aunt May. The decision to give Ant-Man his own movie has proven to be the right move because, unlike Spider-Man, he isn’t thrown into the fray without context. Paul Rudd’s Scott Lang feels like he belongs. And, although Spider-Man is better known (arguably Marvel’s most recognizable superhero), the same cannot be said about this Peter Parker. For all the right decisions Marvel has made about meticulously building their universe, this misstep mirrors DC’s choice to cram Wonder Woman into Batman v. Superman for no reason beyond rushing her to the screen. The production’s tone makes a refreshing change from the dour, gloomy approach adopted by Zack Snyder in Batman v. Superman. The purpose here is to entertain viewers rather than depress them. Tony Stark’s dialogue is peppered with his usual cynical one-liners. Spider-Man quips and banters as he fights (one of his opponents makes a comment about this). And not every scene takes place at night or in the rain. There are plenty of dark moments but they are counterbalanced by lighter scenes. Comic book-influenced movies have reached a point where each one is more interested in outdoing its predecessors than telling a good story. The Avengers remains the best team-up movie to-date - nothing in the past few years has come close to toppling it from that perch. Deadpool is the most entertaining superhero feature to have graced theaters since the 2012 blockbuster. Civil War is better than either the bloated Avengers 2 or the lugubrious Batman v. Superman but it’s not as gripping as Winter Soldier. As far as big superhero mash-ups are concerned, this one whets the appetite without providing a satisfying main course. Marvel continues to tease us about Big Things Yet To Come. One hopes that, when they happen, they’ll be able to fulfill the expectations resulting from the hype and build-up.